Milo was recently gifted with a set of watercolor paints from a friend in his class. It has been really wierd, rainy weather here as of late, so i have been looking for something to do with these watercolors, especially since the last time, milo did so great with them. I came across this idea on pinterest. Basically all you have to do is trace a round item, like a cup or a glass with the black watercolor paint. 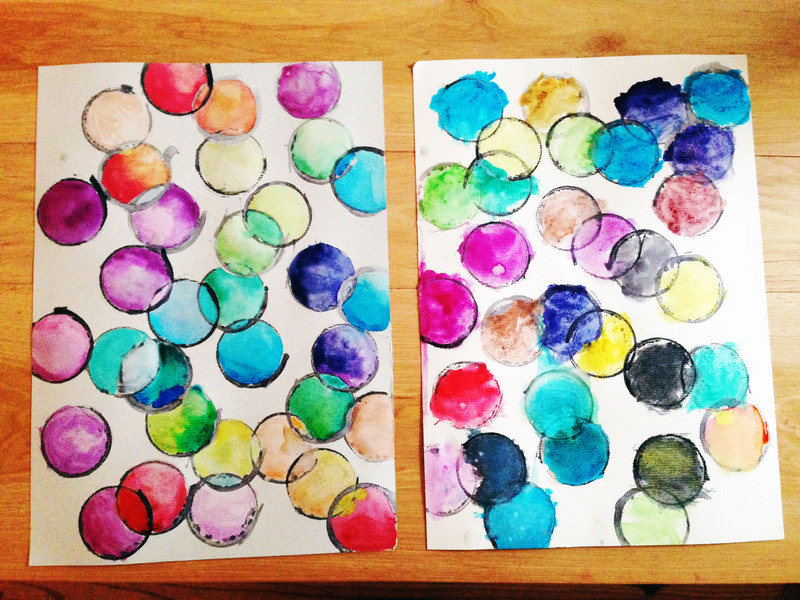 It doesn’t have to be perfect – thats the beauty of watercolor paints! 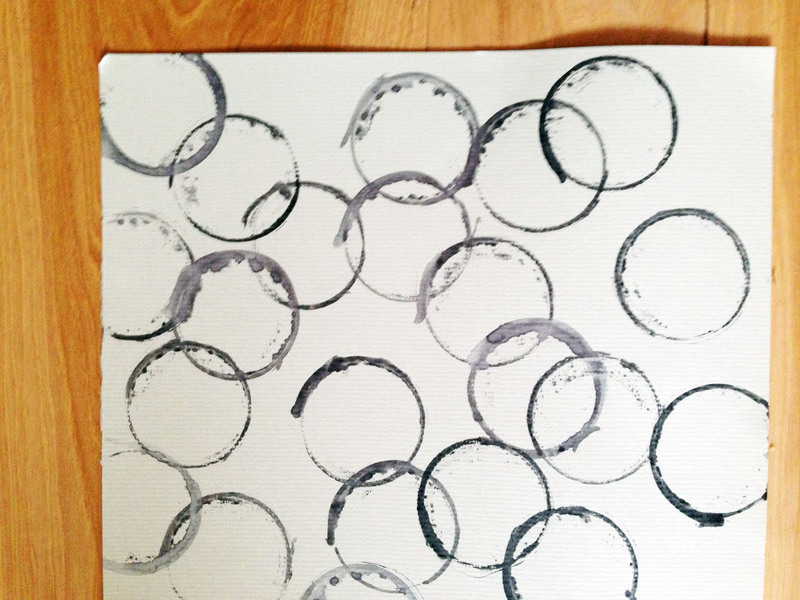 Let it dry and then go to town painting the circles. I encouraged milo to experiment with blending the colors. I also suggested painting the background but he said “that would be too hard for him.” so we stopped after all the circles. Mine is the to the left and his was to the right. It was really fun! Once again, he did a great job with the painting! 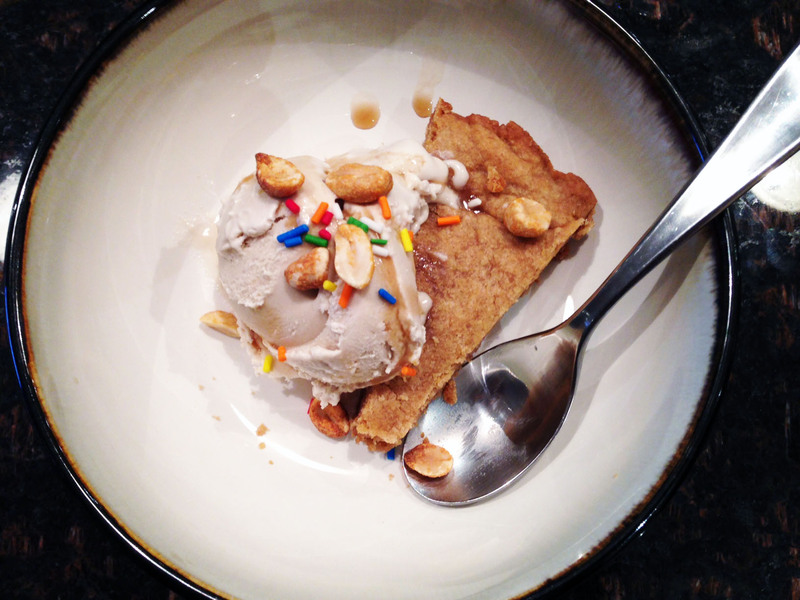 peanut butter skillet cookie with bourbon salted caramel ice cream. This recipe turned out to be a tag team effort! I had dinner at my friend’s house last night and her request was to bring a peanut butter cookies. I knew she was making some homeade icecream, so I made a simple peanut butter skillet cookie to top off with the ice cream. This was her first attempt at making vegan ice cream, and it was FANTASTIC. Holy moly. The combination of the cookie, ice cream and bourbon-caramel sauce was the perfect way to end the weekend. I will definitely be making this next time I need to feed a crowd. YUM. So here are the recipes. I made the skillet cookie. she made the ice cream. Both are vegan and both are out of this world delicious. Preheat the oven to 350 degrees F. In a small bowl, stir together the flour, baking soda and salt. Set aside. In a large bowl, whisk together the earth balance, peanut butter and sugars until smooth. Stir in the vanilla extract. Add in the egg mixture and mix until combined. Stir in the dry ingredients and mix well. Press the dough into a 12-inch oven-safe skillet. Bake the cookie for 25 to 30 minutes, or until it is set in the middle. If at any time the edges become too brown, tent the cookie with aluminum foil. We served the cookie warm, topped with this ice cream. Make it. Now. you wont regret it. Make sure your ice cream churning bowl is frozen and soak your cashews. This is all great to do the night before. Add bourbon and sugar to a small saucepan over medium-high and bring to a low boil. Reduce heat to simmer and swirl DON’T stir, until a bubbly caramel forms. It happens pretty quick; less than 10 minutes so stay close. 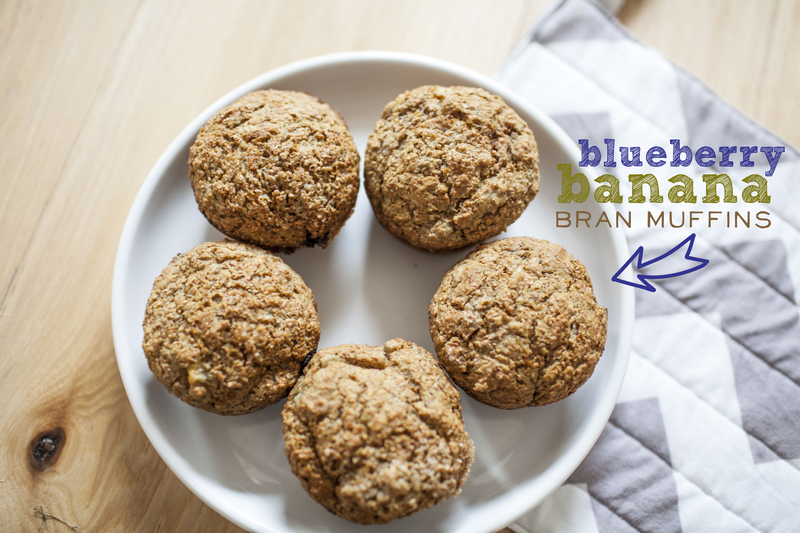 Remove from heat and immediately add 3 Tbsp almond milk, sea salt, and stir. Set aside to cool. Once cooled, taste and add more salt if needed. You could also add a splash more bourbon at this point, but don’t exceed 2 tsp or it can inhibit it from freezing. Add all ingredients except bourbon reduction and tapioca flour to blender and blend until smooth, scraping down sides as needed. Use the “liquify” setting if you have it. You want it to be completely creamy and blended with no chunks. Add tapioca flour and HALF of the bourbon caramel and blend again. Chill remaining half of caramel. Add mixture to ice cream maker and churn according to manufacturer’s instructions – about 45 minutes. It should look like soft serve. Add remaining bourbon reduction in last minute OR stir in with a spoon so there’s a more pronounced swirl. Transfer to a freezer-safe container and cover well. Freeze for at least 4-6 hours or until firm. Set out for 10-20 minutes (OR microwave for 30 seconds) before serving to soften. Will keep for up to 1 week, though best when fresh. 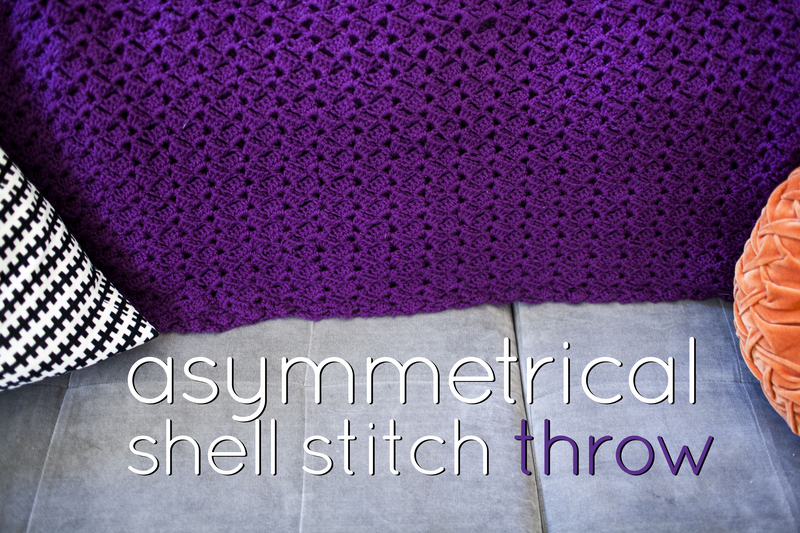 asymetrical shell stitch crocheted throw. Remember last year when I whipped up this baby blanket? Shortly aftewards I started working on an adult sized one. I actually finished this months ago, but have yet to get around to getting it up on the blog. I still have to do some edging to it, but its done and has been sitting on our couch and getting some use. For this throw, I used bernat waverly yarn, and about 10 skeins of it. My little guy just turned five. 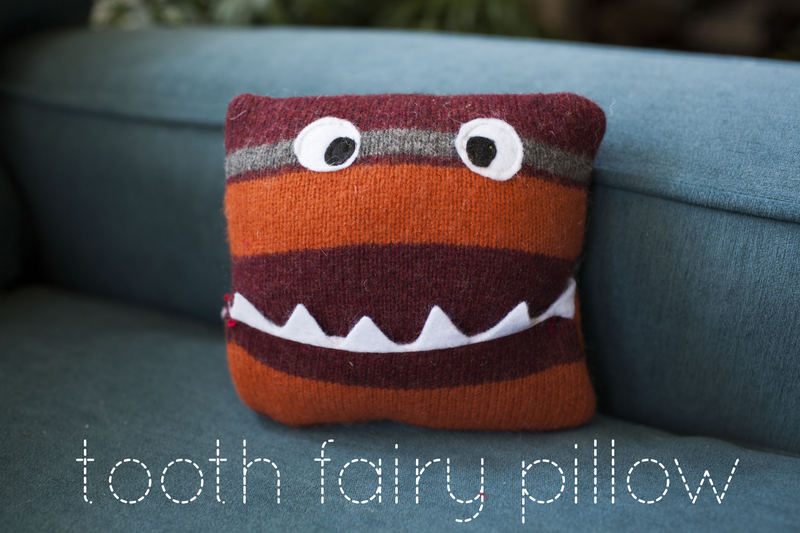 I know were probably still a ways off, but I whipped him up a little tooth fairy pillow following this tutorial. Instead of a fat quarter, I used an old sweater. So its kinda lumpy and a little messy – but I asked milo if i should redo it and he said “no! I love it!” soooo, messy and lumpy toothfairy pillow it is! This is a really easy project that can come together fairly quickly. However, trying to explain the concept of how the tooth fairy works to a five year old proved to be a little tricky. He just wasn’t really understanding HOW the tooth fairy will know that his tooth is in that pillow. And where should he leave the pillow?! And how much money does the tooth fairy leave? Does she leave presents? I think i have some time to do my tooth fairy training, but in the meantime, we have the pillow situation covered. 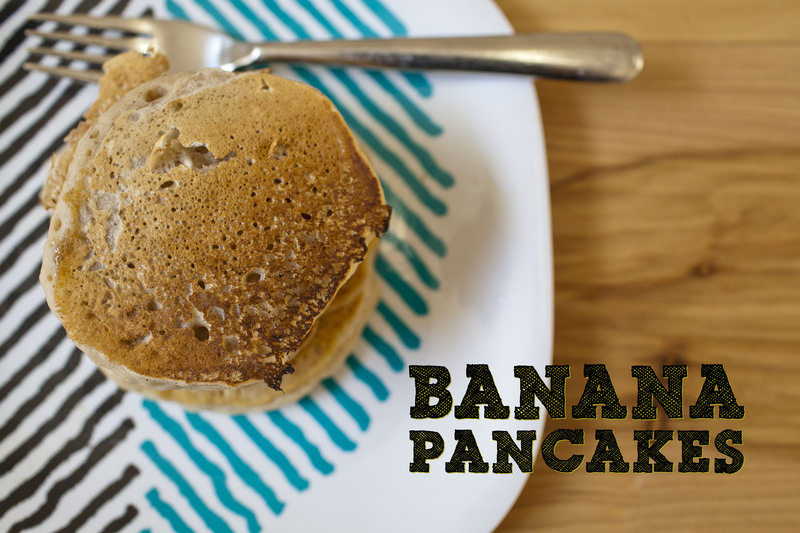 Here is a simple banana pancake recipe that turned out really great and you can whip up in no time! Its adapted from this recipe here. 1/2 teaspoon cinnamonOptional: Chocolate chips or blueberries. In a blender or food processor, puree the banana with the almond milk. In a separate medium sized bowl, mix together the dry ingredients. Pour the banana/milk mixture into the dry ingredients and stir until just combined. Gently stir in the blueberries or chocolate chips if going this route. Grease your skillet over medium heat. Using a 1/4 cup measuring cup, scoop the pancake batter into the pan. Flip when bubbles form in the batter (about 1 minute). Let the second side cook for about 30-60 seconds and remove from heat. Cheez-its were probably my most favorite snack back in the day. I almost always had a box of them at my desk to snack on. I recently saw that Earth Balance was coming out with a vegan version. I CAN.NOT.WAIT. to get my hands on these. So far no luck. it does just so happen though, that I came across this blog post last week and knew that I HAD to make some myself! 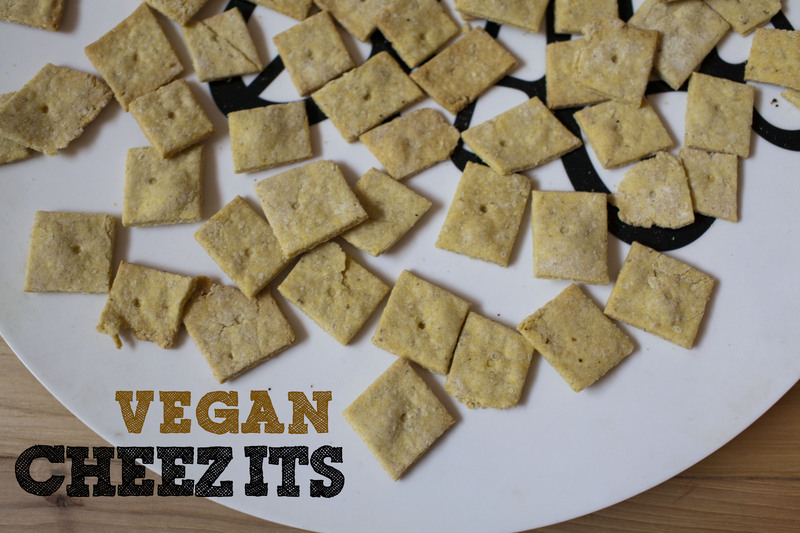 Now, these crackers didnt necessarily taste like the good-ol fashioned cheez its I remember, BUT they were a fantastic, cheezy-savory cracker that came together in no time! Milo could not get enough of these, and frankly, neither could I! Add dry ingredients to a food processor or blender and process to thoroughly combine. Then add olive oil and pulse again until crumbly. Add cold water 1 Tbsp at a time until it forms a loose dough. You don’t want too much water, so just add a little bit at a time. It shouldn’t need more than 3 Tbsp. Lay on a lightly floured surface, dust the top with flour, and roll to 1/8th inch thick with a lightly floured rolling pin. Using a pizza cutter, cut the dough into square crackers. Dot the centers with a fork prong wooden skewer tip to resemble a Cheez-It. Bake at 350 for 12-17 minutes or until puffy and golden brown.